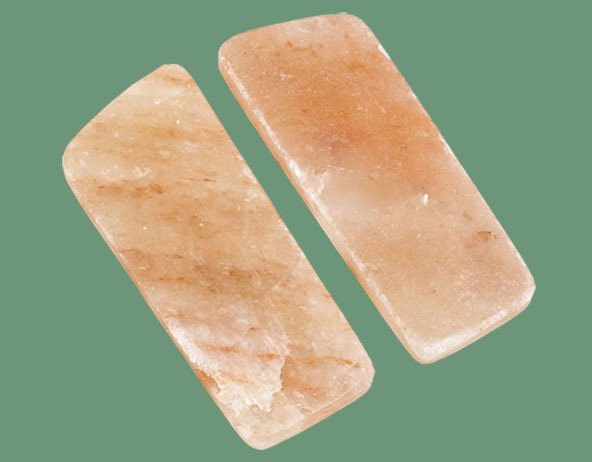 Himalayan Salt Block for Feet helps draw out toxins and impurities from the body. The salt is antimicrobial, antiseptic, hypoallergenic, and ionic. This block will not only detoxify the body, it will also soften the skin and their warmth helps relieve stress and promote relaxation after a long day. It has also been said to help with edema. Himalayan Salt Block for Feet provides aesthetic and therapeutic benefits to the skin, namely areas of the feet and also hands. It works wonders as a general relaxing aid after a long day at the office or strenuous sports or exercise regimen. Its uses are varied and can be customized to individual therapeutic and aesthetic practices such as foot detoxification, reflexology, manicures, pedicures, sports therapy, arthritic hand conditions, etc. How to use Himalayan Salt Block for Feet? Simply place each block in the microwave for about 1 minute and 30 seconds or oven at 250 degrees for about 7 minutes. Be sure to touch the blocks to make sure that they are of a comfortable temperature before applying your feet, the general rule of thumb is that they are significantly warm, but not too hot to bear. Then, place each foot on each block and sit with feet on blocks for at least 20 minutes. You may keep your feet on these blocks for up to an hour and reheat as needed. To clean, simply wipe down with a damp cloth. Apply a high quality lotion or oil such as Jojoba or Coconut to either feet or hands and rest on the Detoxification blocks for 15-30 minutes. If both feet will not fit comfortably on the Detoxification blocks, individual treatment for each foot maybe necessary. Covering hands or feet with a slightly damp thin cloth or towel will enhance the therapeutic aspects of these treatments. Essential Oils such as rosemary, lavender, and chamomile are great for both feet and hands. Lotions or creams that contain these ingredients or a few drops of pure essential oil may be added to enhance the effect. For skin or foot fungus such as Athlete's Foot, we recommend Tea Tree oil. Thyme and Lemon Essential oils can be very powerful and only a few drops are usually necessary. Be careful not to get essential oils into your eyes and wipe hands after each use. Preliminary skin patch tests are advised to determine sensitivity to any essential oil.